The Washington Nationals aren’t wasting any time when it comes to improving their team for a possible playoff run. 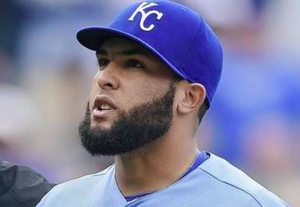 Monday night, the Nationals acquired closer Kelvin Herrera from the Kansas City Royals. The Royals will receive three prospects: infielder Kelvin Gutierrez, outfielder Blake Perkins, and pitcher Yohanse Morel. Herrera could turn into a huge asset for Washington’s bullpen. The 28-year old is having the best season of his career. In 27 appearances for the Royals this season, Herrera has a 1.05 ERA, saving 14 games in 16 opportunities. He’s been a steady and consistent part of Kansas City’s bullpen since 2012. But this has been his best season by far. With Herrera set to be a free agent this winter, the Royals were always likely to trade him this summer. Knowing he’d likely be available, the Nationals were proactive in going after him. Washington’s bullpen isn’t one that can be considered one of the best in baseball. But adding Herrera could help their standing substantially. Sean Doolittle has been Washington’s primary closer this season. The lefty is 18 for 19 in save opportunities while posting a 1.47 ERA. However, the rest of Washington’s relievers have all been solid but unspectacular. Ryan Madson, Brandon Kintzler, and Sammy Solis have been the primary setup men in front of Doolittle. Herrera now figures to serve as the primary setup man for Doolittle. The Royals, meanwhile, got a decent return for a player who will be a free agent this winter. Gutierrez becomes Kansas City’s no. 8 ranked prospect, according to MLB.com, who’s currently at double-A. He’s viewed as an above-average hitter and above-average fielder at third base with a little bit of power. Perkins is listed as Kansas City’s no. 15 prospect, according to MLB.com, following the trade. He’s regarded as a plus runner and plus defensive player, although he’s struggled offensively in A-ball this year. Morel is a 17-year old pitcher who is yet to pitch outside the Dominican Summer League. This is already the second trade the Royals have made this summer. Earlier this month, the Royals traded Jon Jay to the Diamondbacks. Kansas City is clearly in rebuilding mode, so they will not be shy about continuing to trade players who will be free agents this offseason. More importantly, the Nationals improved their bullpen in a big way with this trade. If Herrera can continue to perform the way he has this season, he may end up being the most impactful relief pitcher who gets traded this summer. The Washington bullpen still has a long way to be considered among the best in baseball. But adding Herrera for the rest of the season is a big step in the right direction.